The Internet of Things has been a buzzword for over few years now, but it is only lately that we've begun to see its true potential as a game changing technology. In the simplest of terms, IoT is a concept of everyday objects - from streetlights, to industrial machinery, and even wearable devices - which are interconnected using built-in sensors and share relevant data wirelessly amongst each other. With thousands of applications currently in use and new ones being discovered daily, it is not too far to assume that soon major part of our lives will be impacted with IoT devices in some way or the other. The statistics also point towards a future where more than 50 billion devices would feature internet of things technology in some form or another by 2020, which will grow up to 1 Trillion devices by 2025. This 75% growth is being attributed to non-hub devices such as sensor nodes and accessories. For market researchers, its second nature to keep looking ahead as well as pay enough attention to the present and the past. For them, the next evolution of Internet of things is the "Internet of everything" where the focus not only relies on the devices between which data is transferred, but also on how the data is transferred. IoT sensors are by default internet-enabled, and data is always shared or received via the cloud. As a result, IoT has major implications when it comes to cloud computing, streaming analytics, big data, data visualization, etc. With massive amounts of data available for their perusal, market researchers will be able to collect data and suitably process and analyze it, thereby leading cloud vendors such as Microsoft Azure, Amazon Web Services, etc., benefit greatly from it. Market researchers generally consider the tech industry as the first adopters of brand-new technical innovations, and focus their attention and research towards that viewpoint. But when it comes to Internet of things in market research, it is the old school industries such as manufacturing, government, oil and gas, etc. which are actually leading the IoT revolution. IoT has found greater acceptance in such industries and from detecting pressure drops in oil pipelines, to monitoring traffic, parking, etc. within city confines, the internet of things has slowly risen to prominence in some of the more conservative industries which adopt technology at a very slow pace otherwise. For market researchers, it is extremely important therefore to focus on such industries when trying to find out future patterns for IoT usage. While it is the hardware sensors, and their many variants which raise the most interest and are considered research-worthy, market researchers must also focus on the underlying software foundation which helps to transfer large amounts of data from one place to another, more often than not, in real-time! Focusing on the code which supplies the hardware with its ability to perform can help researchers gather useful information which might be overlooked otherwise. Going forward, since researchers are in the discovery phase of the IoT trend, qualitative studies will be able to generate more concrete results. This is because a quantitative survey will have to be almost entirely based on guesswork, and most respondents might not even understand the questions fully because of the ambiguous nature of the subject. Therefore a qualitative study which asks questions such as what are people doing about IoT, the importance of IoT in their projects, the unexpected problems faced, etc. can shed new light for your research. The whole focus of IoT is to make data sharing and disseminating easier. As a result, most of the major corporations in this field such as Microsoft, Cisco, etc. will build secure IoT devices and spend millions of dollars into making the internet of things a highly secure, level, playing field for a multitude of devices. At the same time, this field will also attract thousands of startups, who just won't have as big a development budget as the big players, thereby leaving the security of the device up for guesswork. Building something secure is always more expensive, and therefore the security component of the device should be a focal point of many research projects. 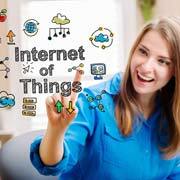 How much does the general populace care about security in IoT? Does security affect their purchasing behavior? Such questions can help market researchers deduce future trends. At O2I, our market research offerings help to provide you with additional visibility into a sector of your own choice. We are one of the world's leading service providers for real-time market intelligence for all things related to the internet of things and machine-to-machine (M2M) communication. We combine our 20 years of experience with our IoT expertise to provide IoT-integrated market research services for both medium and large-scale businesses. Contact us now to know how we can help your business with advanced and streamlined market research.